Each "Puppy distro" built by Woof is a distinctive distribution in its own right, with unique features. You choose a puppy based on your particular needs, be it specific hardware, software, or access to and compatibility with the package repositories of a particular distro. Please note that some puppies that are not built from the latest version of Woof, or remasters of an earlier release of Puppy, may not have all of the above features. Lucid Puppy 5.0 consists of the popular Puppy Linux architecture that Puppy founder Barry Kauler has been refining through 4 editions of Puppy Linux. But this time Puppy is built with binary packages from the latest Ubuntu release Lucid Lynx, hence Lucid Puppy 5.0. The Puppy architecture is well known to be lean and fast, and friendly and fun, and Lucid Puppy is no exception. Because of the Ubuntu binary files, the development time to produce program packages that are tested and configured for Lucid Puppy is extremely short. In fact, one thing that is new in Lucid Puppy is Quickpet, offering many Linux programs ready to use with a single click. So, click, and you can be using Gimp to edit pictures, Kompozer to build a web site, Songbird to manage your music collection, and many others. Because Puppy is built for personal computers, there is a choice in browsers: the four main ones, Firefox, Seamonkey, Chromium, and Opera are all also available for one-click installation. Some people even like to alternate browsers so Lucid Puppy has a simple program to select whichever of the browsers you would like to set as default. Another thing about Lucid Puppy is that it boots directly to the desktop. Many people will not need to do anything more than that in order to begin using Lucid Puppy. However, if there is anything you want to change, the tools to personalize the desktop are all immediately at hand. Locale and Language can be changed with just one click and many of the programs, including the word processor Abiword, the spreadsheet Gnumeric, the text editor Geany, and the browser Chromium, open immediately in the language of choice. For other programs such as Firefox, selecting one’s language involves just a few more clicks than that. Yet another of the tools that needs very few clicks is a new tool for connecting to the Internet, named Simple Network Setup, which it is. Lucid Puppy also has a very simple, one-click Update feature to download and install any necessary bugfixes. Here is one other thing about Lucid Puppy that is kind of interesting: it is the first major edition of Puppy Linux (1 through 4, and now 5) that was not directly prepared by Barry Kauler. For this 5th Puppy, it was the entire Puppy community that did the work, with Mick Amadio, Chief Developer, and Larry Short, Coordinator. 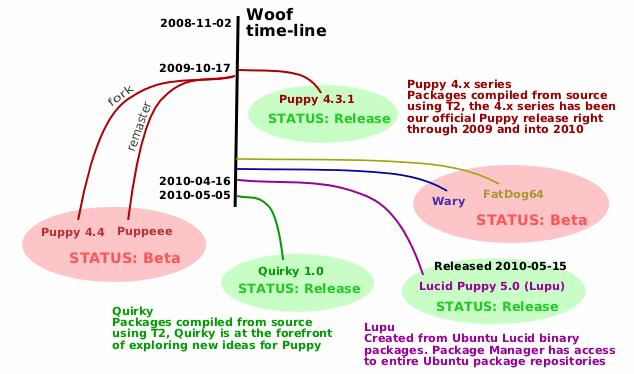 The packages for Puppy 4.0 were compiled from source using T2 (http://t2-project.org) back in November 2007. There have been upgraded packages since then, however the original base packages (such as Xorg 7.3) are still being used. In fact, the latest official release, 4.3.1, has been and continues to be our most popular Puppy, and is still "going strong", with many puplets (other puppies based on 4.3.1, such as Puppee, NOP and Lighthouse Pup). Arguably, if this guy works for you, why change? The 4.x series is currently undergoing upgrading, with significant improvements. The proposed 4.4 is currently at alpha status: http://puppylinux.org/wikka/Puppy44 . Barry Kauler, the founder of Puppy Linux and Woof, created Quirky as an avenue to explore the latest ideas. There may be some features in this distro that you won't find in other puppies, either different applications and utilities, different system scripts/behaviour, or even some fundamanetally new underlying behaviour. This is very much a moving target. Quirky is currently built from packages compiled in T2. Some of the ideas may be a bit strange, hence the name "Quirky"! Wary is intended to be state-of-the-art, built with the latest Woof and recent packages, except for some rollbacks where newer packages are considered less than satisfactory. Currently, Wary uses the same T2 packages as Quirky, but Xorg is rolled back to version 7.3 (as, quite frankyly Xorg 7.4 and 7.5 have a lot wrong with them). Wary may be your better choice for older video hardware. Very Wary goes one step further and also rolls back the kernel to version 2.6.30.5 -- again, this may suit older hardware, also we have a large collection of drivers for old analog modems with this kernel -- we are unable to compile many of these drivers with later kernels. FatDog64 is recently compiled from source using T2 and optimised for the Intel 64-bit x86 (and compatible) CPUs. This built tends to be leading-edge in terms of features and application versions. Puppeee is a remaster of Puppy 4.3.1, optimised to run on the EeePC netbook. A lot of work has gone into compatibility with EeePC hardware, so this distro is a good choice if you have one of these netbooks. The developer is also planning "Fluppy", which will target a wider range of netbooks.